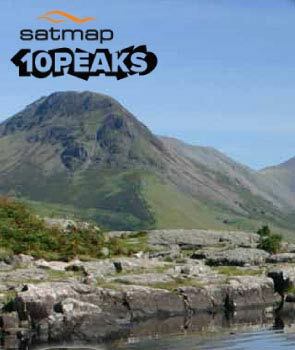 The Satmap 10 Peaks is designed to test the hardiest competitors. Many who entered found that it was the toughest challenge they had ever done. It’s not just the 73km, or even the 5600m of ascent which catches people out, but the unforgiving terrain making progress slow. 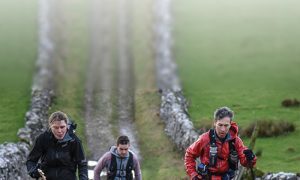 Climbing the Lake District’s 10 highest mountains in one day makes this event an incredible mental and physical challenge. Now in its third year the event that most said was too hard, too far, was full two months before the big day. Of the 250 entrants, 202 made it to the start line at the foot of Helvellyn. The race started at 4am on Saturday July 21st in near perfect conditions. For the back of the pack, Helvellyn acted as a good filter and a good indication of what was to come. For the front runners it was an opportunity to check out the competition. By the time everyone was down to the first check point 110 minutes separated the leader and the last place competitors. The check point gave competitors the chance to refill their water bottles, pick up some energy snacks and grab a hot drink before heading off through Wyth Burn aka ‘the bog’! Last year’s winner, Adam Jackson, was first through CP1 having taken the shortest route down from the summit, but a recent illness soon forced his retirement. Most of the leaders opted to take the footpath on the right of the stream, many having reccied that part of the course over the preceding few days to see which option was dryer! The route up to High Raise is a deceptively long slog due to the boggy conditions, and High Raise, although a Bob Graham Round peak doesn’t even count as one of the 10 peaks – it just happens to be in the way. The second peak, Bowfell is the first on the horseshoe that leads to Sca Fell. Once at the summit it is possible to tick off a number of peaks with relative ease with only a few ‘bumps’ in the way such as Esk Pike. Mark Bottomley was the first to reach CP2 at Esk Hause, arriving at 7.45am, one minute ahead of Daniel Longster. By the time the leaders reached the summit of England’s highest mountain, Scafell Pike, Mark had opened up a seven minute lead with the third place man a further 17 minutes behind. At this point the course provides two options to reach Sca Fell – Lord’s Rake or via Foxes Tarn. The leaders all opted for the Rake but the tail-enders (who were now up to 5 hours behind) were advised to miss Sca Fell in an effort to get back on schedule and received a one hour time penalty for doing so. Once on Sca Fell competitors could take the Standard Route along the Corridor Route to Great Gable and then out and back to Pillar, or the Alternative Route, descending 900m into Wasdale, before ascending Pillar via Wind Gap. Although last year’s winner took the Alternative Route, the thought of the long hard climb up to Pillar from Wasdale made the decision easy for most who chose to stay high and onto Great Gable. By the time the leaders reached CP3 at Beck Head, Mark Bottomley had opened up a 51 minute lead on Daniel Longster with Simon Martland 14 minutes further behind. However Daniel’s second place was under threat and by the time they reached CP4 (Honister Slate Mine) Simon was just ahead in second place. Honister (also known by some Marshals as ‘Zombie Central’!) provided the opportunity for all competitors to enjoy a hot drink and meal, however the leaders raced on without hesitation. To make it to Honister is an incredible achievement having climbed 9 of the 10 highest mountains. The thought of the distance to get to the foot of Skiddaw, let alone the long hard climb awaiting, was too much for most and the mini bus was overrun with people wanting to retire. For the walkers who decided to continue, it was a long night, first heading up to Dale Head Tarn and then on to CP5 (Nichol End Marine). Then came the toughest mental challenge: resisting the temptation to walk back to their accommodation as they passed so close to Keswick before approaching Skiddaw via Carlside. Mark reached CP5 70 minutes ahead of second place Simon, but didn’t show any signs of slowing, not even taking the time to take his head torch off which he had worn since the start! Mark Bottomley finished at the Keswick Country House Hotel, knocking an impressive one hour off the previous course record, in a time of 13 hours 27 minutes. Simon Martland was second in 14 hours 34 minutes and Daniel Longster third in 15 hours 56 minutes. Becky Kingdon lead the woman’s race from the start destroying the course record by an impressive 4 hours 24 minutes to record a time of 18 hours 2 minutes and in joint 6th place overall! 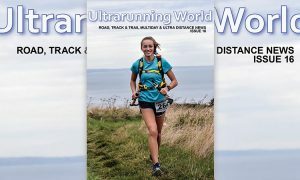 Second place went to Rebecca Hedderick, 19 hours 18 minutes and third place Clare Page in 19 hours 38 minutes. 77 of the 202 starters completed the course with 64 finishing within the 24 hour cutoff. Paul Smith, Race Director, thanked all the competitors (who between them raised over £28,000 for Macmillan Cancer Support), marshals and sponsors who made this event possible.